December's update brings you two new B & G pieces we have not seen before. The first item is a B & G wood inlay picture with a subject that is actually 'new' to us. 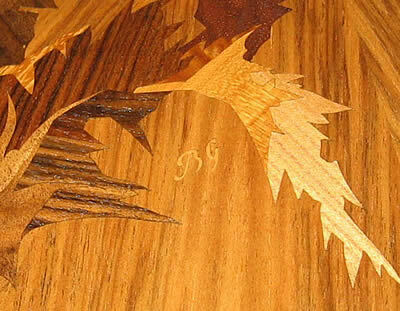 It may be one that is familar to some you as possibly "Quartet" but, with the title of "the Music Group" it becomes a B & G wood inlay picture we have not previously encountered. The second of these items for December features a B & G round table with a beautiful inlaid design which is not seen in our official B & G lists. Perhaps you, one of our web visitors has a similar table and can enlighten us with the correct title for this very delightful piece. We are always pleased to learn anything new B & G wood inlay wise. Our December 2011 update brings you two previously unseen B & G pieces. 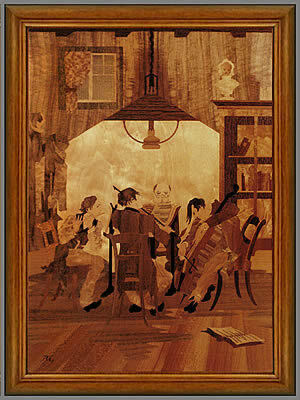 We start the December update with a rarely seen B & G wood inlay picture titled "The Music Group"
"I was an Air Force Captain stationed at Hanscom AFB in Massachusetts. Someone told me that I could take a “Space-A” flight to Germany out of Pease ANG Base in New Hampshire that flew directly to Frankfurt, GE and I could go Space-A on other aircraft from there. We could have a nice European vacation without all that pesky airfare bother. With money very tight, we decided to try it. We boarded the C-141 Starlifter before dawn and set off to Germany. The aircraft was filled with large supply bundles and we got to sit along the side in canvas strap chairs. As a bonus, the aircraft was noisy and unheated. Luckily, we watched the fueling experts on board refuel several F-16s in transit which took our minds off the numbing cold. Upon arrival, we spent a few days at Rhein-Main AB while waiting for our next air lift to Spain. In the Air Terminal, there were loads of nice shops filled with wonderful German gifts, including beer mugs and wine glasses, Christmas decorations of all types, cuckoo clocks, figurines, beautiful crystal, kitchen knife sets, paintings of all sorts, the latest electronics, and the like. Having grown up in a musical family, I could almost envision myself in the picture. My sister played the flute in the Maryland Symphony, my cousins played violin and cello, and I played the oboe. All were represented in this one picture. I had to have it. For the last 30 years, I have always displayed it prominently in my house. My sister is very jealous and tried to “borrow” it one time." Thanks for sharing your picture and wonderful story with us Harold. 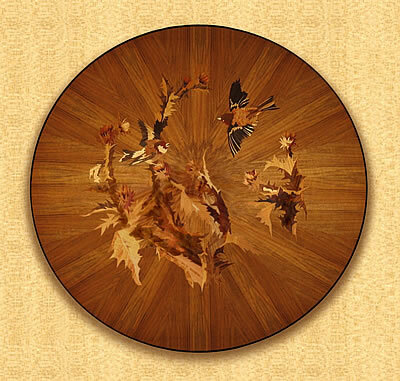 Our next B & G piece for December is what could be, a unique B & G round table. As we said earlier, we have not encountered either of these pieces before, so they could be a couple of unique pieces. If any of you, our readers, have a similar piece we would love to hear from you. Every other Friday I drive from New Hampshire to Connecticut (400 miles round trip) to visit my dad (91) for the day. He and I have lunch and then shop at the "johnny cake center" in town. The "johnny cake center" is a non-profit which takes in donations, clothing, furniture, dishes, whatever, then sells it and uses the monies to help people in the town with food, fuel and needs. About a month ago we were walking through the 'johnny cake center' and my sister pointed out this round table with a removable glass top. We thought it was beautiful workmanship, although the glass top was dirty,and the wood was badly crackled, with some of the varnish(?) worn away. The price was $60. I brought the table to the check out. The volunteer check-out person had been working a few days earlier when a woman around 50 years old brought in several items from her mothers estate. She told the volunteer that her mother and father had purchased the table in Germany. That was all the information she had. She said no-one in her family wanted the table so she was there to donate it. I paid the $60 and loaded it into my van. My husband was not thrilled when I arrived home with another "treasure". He went to the local hardware store and bought varnish thinner, acetone, denatured alcohol, stripeze, and mineral spirits. We removed the glass top, the legs (screw on) and began working on the crackling. We tried everything, and nothing would 'cut' the varnish...so maybe it wasn't varnish? We contacted a local restorer. He suggested using fine sandpaper to 'cut' the sealant. My husband sanded the sealant off very carefully, then applied tongue oil. None of the marquetry lifted or is in any way compromised. It is an absolutely beautiful work of art. One man's junk, is another man's treasure!!! Click the above button to return to page 34 of "Can You Help"